Dependence of high-rises on diesel generators has turned them into virtual power plants that spew harmful greenhouse gases. Setting up solar panels is a viable alternative. Can we make the transition? When the Delhi government banned the use of diesel generators by high-rises on November 7, residential societies like Satisar in Dwarka were left wondering for a solution. Located in southwest Delhi, the eight-floor-high apartment faces a daily power cut of at least 40 minutes, and the ban, which will remain effective till January 31, would render essential services, such as lifts and motor pumps, unusable. 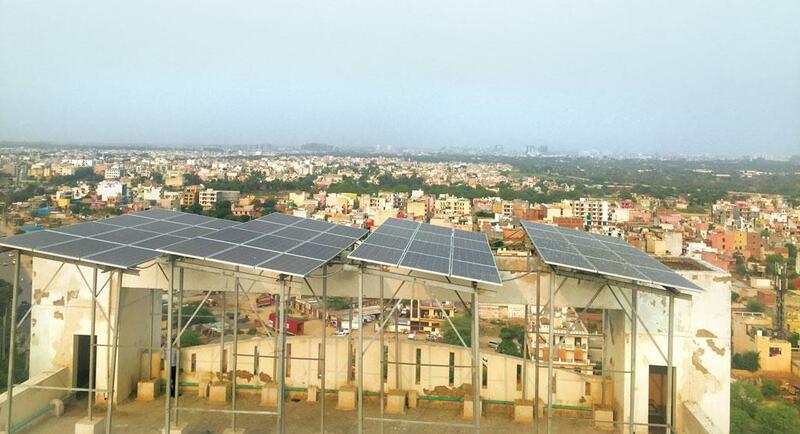 Bestech Park View residential society in Gurugram, Haryana, however, has found a solution to its power woes. Facing a daily power cut of around 35 minutes, the high-rise installed rooftop photovoltaic (PV) panels this March. 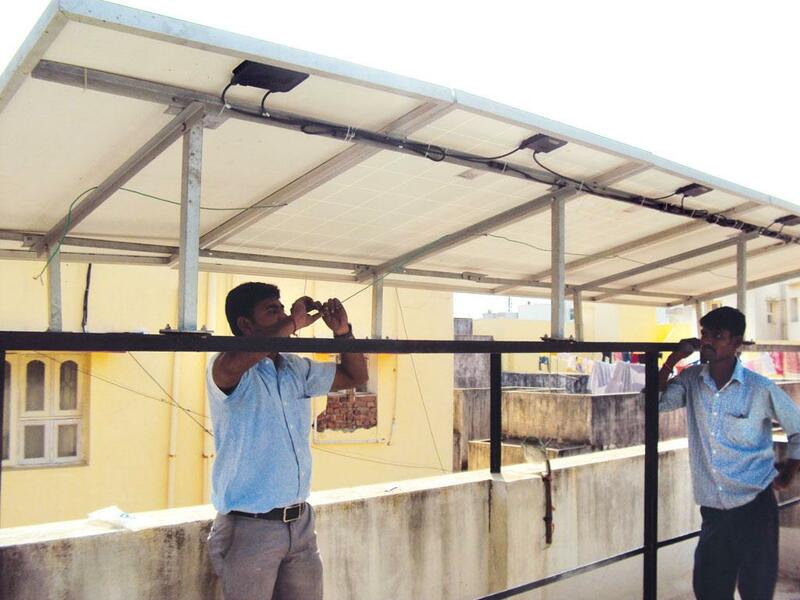 Rajiv Verma, treasurer of the society’s resident welfare association (RWA), who proposed the idea in November last year, says that it took the society just four months to shortlist the company to install the panels and start generating solar power. The panels, installed by Hyderabad-based Fourth Energy Partner, produce 268 kWp (the maximum output power given by a solar module under full solar radiation) and provide 8 per cent of the total power requirements of the high-rise. Though the Delhi government order was passed to preempt a Diwali-like smog in the national capital, it has made residential societies rethink their power backup options and find alternatives. Residential societies, shopping malls, industries and numerous other sectors depend on diesel generators for power backup. But due to their “decentralised” usage, they are difficult to monitor. According to the Central Electricity Regulatory Commission (CERC), the total power generation capacity of diesel generators in India is 90,000 MW, which is equivalent to the total installed power capacity of the United Kingdom. Though power outages in urban India have been reducing, the country’s diesel generator market has been growing at a rate of 5,000 MW to 8,000 MW every year, estimates CERC. According to Central Electricity Authority (CEA) data, this is higher than the cumulative nuclear and solar capacities being added year-on-year. One reason for this is increase in the purchasing power of urban India. According to RWABhagidari.com, an online network of RWAs in Delhi, the national capital alone has over 700 registered societies and almost all of them own diesel generators. The capacities of these generators range from a few hundred kilowatts to more than a megawatt. High-rises in urban centres of India are virtually power plants because they depend on polluting diesel generators (see ‘Smoke generators’). A 2013 study by Sarath Guttikunda, an independent researcher and founder of UrbanEmissions.info, an online repository of air pollution data, found that they contributed 6 per cent of PM2.5 and 10 per cent of PM10 levels in Delhi and its satellite towns. Pollution from diesel generators is more hazardous than pollution from thermal power plants because plants emit the pollutants in the upper atmosphere while generators are located near houses and markets. The pollutants from them remain suspended in the lower atmosphere. To check carbon monoxide (CO) and particulate matter, modern diesel generators come installed with a diesel oxidation catalyst (DOC) to oxidise and convert CO into carbon dioxide (CO2), which is a greenhouse gas but not as poisonous as CO when inhaled. However, there is no data available on how many generators are equipped with DOCs. Even if DOCs are installed, their efficacy and periodic maintenance remain unmonitored and questionable. In addition to the environmental burden, diesel generators could turn out to be a loss-making investment. In metropolitan cities they are operated only for a few hours every week. This translates to a very high per unit cost of generation. Moreover, the government plans to provide round-the-clock power to all households by 2019. If that happens, generators will be redundant. One clear alternative in this situation is installation of solar rooftop PV modules with battery to store the power generated. Not only is the power generated from solar panels clean, it has also become cheap, thanks to a massive 70 per cent global decline in PV costs in the past five years, as per data on the website of pvXchange, a German company involved in marketing of solar modules, inverters and PV components. But despite this, the shift from diesel generators to PV modules has not happened. Is it due to lack of government policies or are there problems in implementation? 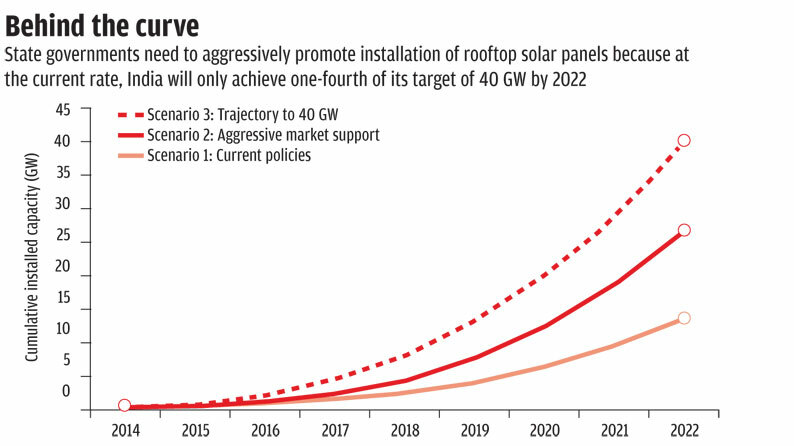 India’s solar rooftop PV goals are highly ambitious. In July 2015, the Union government scaled up the solar power generation target from 20,000 MW to 100,000 MW by 2022 under the Jawaharlal Nehru National Solar Mission. Of this, 40,000 MW is to be generated from rooftop projects. This capacity is equal to the current total solar capacity of Germany. It took Germany over 12 years to reach this capacity while India plans to achieve it in less than seven years. Do we have space to install panels that can generate 40,000 MW? A conservative estimate by the National Institute of Solar Energy shows that the total potential of rooftop solar PV in India is 42,800 MW. To encourage rooftop projects, the Union government provides 30-70 per cent capital subsidy (which differs from state to state) and soft loans through banks. But despite immense potential and adequate subsidy, India has shown sluggish growth in this sector. A total of 866 MW of rooftop solar capacity had been sanctioned by December 2015 under thousands of individual and society rooftop projects, which have different timeframes for completion. As per the latest data available with the Ministry of New and Renewable Energy, the total installed rooftop capacity in February 2016 was 166 MW (see ‘Who stands where’). With the current growth rate of solar rooftop PV, India is expected to achieve only one-fourth of the target. “We are projecting about 7,000 MW by 2020 and about 12,000 MW by 2022 if the current pace of growth continues,” says Narasimhan Santhanam, co-founder and director of Solar Mango, a Chennai-based solar power consultancy (see ‘Behind the curve’). It is clear that the current policies are inadequate to meet the required growth of solar rooftop PV. Replacement of diesel generators with solar in residential societies is a good opportunity. But is this transformation feasible? Can rooftop panels be an adequate substitute for diesel generators? A typical solar rooftop PV plant has three main components—solar PV panels, inver ter and battery. The solar panels generate power during the day, which is consumed instantly by the residents and the excess power is stored in the battery for power outages. By changing the size of these three components, one can customise the solar rooftop PV plant according to the site conditions. For instance, if a location faces long power cuts, then bigger size battery could be installed to store more electricity. Or if the outage is for a smaller duration but the society needs a larger backup to run air-conditioners, then a larger inverter can be employed. 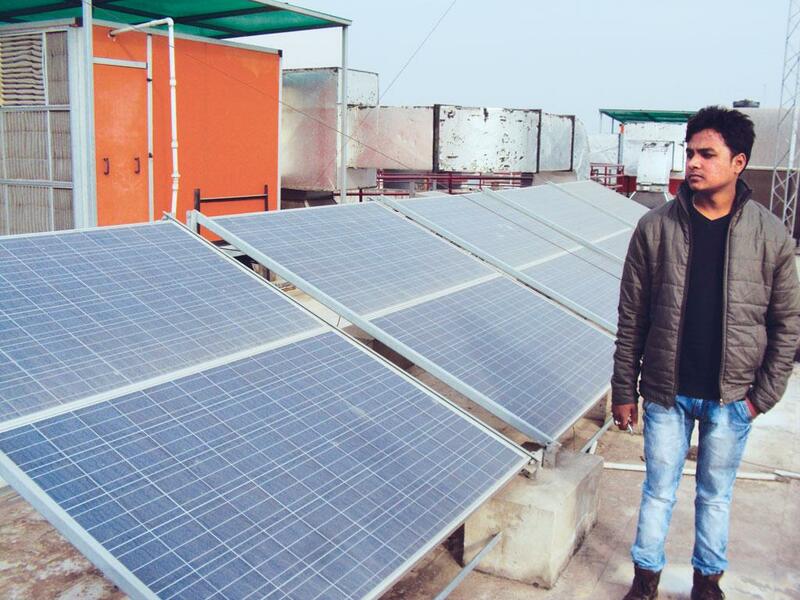 To gauge technical and commercial feasibility of replacing diesel generators with solar rooftop PV, Delhi-based non-profit Centre for Science and Environment (CSE) undertook a study in five high-rises in Delhi-National Capital Region and Jaipur in Rajasthan (see ‘Clean and cost-effective’). None of the apartments studied has solar panels and all of them have diesel generators. The study tried to gauge, on the basis of factors like rooftop surface area, outage duration, average solar energy received and energy requirement of the society, if solar panels can replace diesel generators in these societies. It emerged that solar panels were better than diesel generators on almost all parameters—from tariff to environmental burden. Lower tariff: During a power outage, RWAs supply electricity through diesel generators and charge the residents according to the monthly operational hours. Usually, heaters, air-conditioners and other energy-intensive appliances are excluded from the power backup by diesel generators. Typically, the diesel generator tariff is Rs 15-17 per unit, which is almost three times the tariff charged by discoms. If the capital expenditure is included, this tariff comes to more than Rs 23 per unit, which is nearly four times the tariff charged by discoms. However, as per the CSE study, power from rooftop solar panels, is Rs 5-7 per unit. 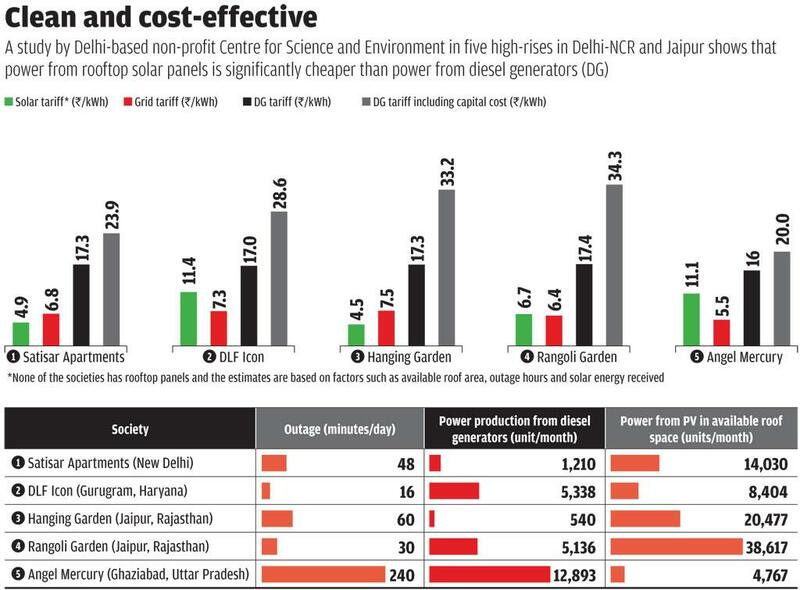 In all the five apartments covered in the study, solar power was found to be cheaper than power from diesel generators (see ‘Clean and cost-effective’). In two societies (Satisar Apartments and Hanging Garden), solar power was even cheaper than the power from the grid. Use it every day: The biggest economic benefit of solar power is that it can operate even during non-outage hours and supply the power generated in real time. If there is excess power generated, it can be fed back into the grid. Therefore at the end of the month, the residents not only get backup power supply, but can also reduce their electricity bill. Because of this benefit, unlike diesel generators, solar panels will remain useful even if there is no power outage. Good for the environment: In the current Indian electricity generation mix, one unit of solar power is equivalent to saving 820 g of carbon dioxide, says CEA. For residential societies that consume thousands of units of electricity from diesel generators annually, solar power gives an opportunity to offset 50 tonnes to 380 tonnes of CO2 per annum. Although solar rooftop PV is an alternative for diesel generators, it does have a few limitations. In societies where power backup is used for running power-intensive household appliances, such as air-conditioners and geysers, solar panels will not be feasible. In societies where the terrace is used for water storage or community events, RWAs will have to be willing to create artificial roofs through steel structures protruding outside the buildings to set up solar PV modules. But despite these minor drawbacks, solar power plants with battery outperform diesel generators in all aspects. It is time for us to recognise that the urban residential society diesel generator is heading towards extinction. “Even if the required roof area is not available in the societies, we can create them as a building extension. This will also provide additional shade and reduce the heat gathered by the building,” says Chandra Bhushan, deputy director general of CSE. “What we need is the change in mindset among RWAS, builders and the general public. They must recognise that solar is the best alternative on both economic and environment front,” he concludes. Since Solar is intermittent,storage makes it imperative. At present Storage in batteries of solar PV power has become expensive. Hence the need to promote CSP on a massive scale which is much ahead in Efficiency. Also Solar Co-operatives on the lines of those in US and Roof top solar/wind hybrid systems make sense in India in view of Apartment culture of high rising buildings prevailing in Towns and Cities.